From the early 17th century to the 1830s the French possessed huge tracts of territory in North America, the Caribbean, French Guiana, Senegal and Benin. This empire included the richest colony in the world, Saint-Domingue (Haiti) and France's largest landmass in Nouvelle-France (now Quebec). From 1604, French colonists and government engineers built massive, expensive buildings on the model of Versailles and the grand palaces, townhouses, and churches of Paris in places like Quebec City, Cap-Francois (now Cap-Haitien), Martinique, Guadeloupe, Saint-Louis, Senegal, Gorée Senegal, and French Guiana. The most palatial were the Chateau St. Louis in Quebec city, the Government building in Cap-Francois, the Governor's mansion in Cayenne, and the church (now cathedral) in Cap-Haitien (now Our Lady of the Assumption Cathedral, Cap-Haïtien). 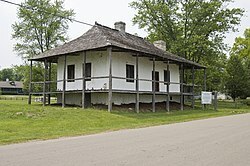 The French also built extensive structures in Louisiana, especially in New Orleans and plantation country Destrehan Plantation, although very little survives today from the French period. 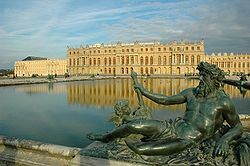 Nevertheless, French-style buildings were built there for a long time, as they were in post-colonial Haiti, notably the Sans-Souci Palace of King Henry Christophe. During the mid-19th century when Napoleon III established the Second Empire, Paris became a glamorous city of tall, imposing buildings. Many homes were embellished with details such as paired columns and elaborate wrought iron cresting appeared along rooftops. But the most striking feature borrowed from this period is the steep, boxy mansard roof. You can recognize a mansard roof by its trapezoid shape. Unlike a triangular gable, a mansard roof is almost vertical until the very top, when it abruptly flattens. This singular roofline creates a sense of majesty, and also allows more usable living space in the attic. In the United States, Second Empire is a Victorian style. However, you can also find the practical and the decidedly French mansard roof on many contemporary homes. 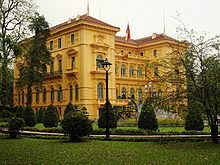 Notre Dame du Haut – "Chapel du Ronchamp"
The Presidential Palace of Vietnam, in Hanoi, was built between 1900 and 1906 to house the French Governor-General of Indochina. The French Society of the Bor Mines - directorate, in Bor, Serbia was built in 1938. Today this building belongs to RTB Bor mining company. French Colonial is a style of architecture used by the French during colonization. Many former French colonies, especially those in Southeast Asia, have previously been reluctant to promote their colonial architecture as an asset for tourism; however, in recent times, the new generation of local authorities has somewhat 'embraced' the architecture and advertise it. ^ Kalnein 1995, p. 1. ^ Werner Jacobsen, "Saints' Tombs in Frankish Church Architecture" Speculum 72.4 (October 1997:1107-1143). ^ Gauvin Alexander Bailey, Architecture and Urbanism in the French Atlantic Empire: State, Church, and Society, 1604-1830. Montreal: McGill-Queen's University Press, 2018. Laon Cathedral is a Roman Catholic church located in Laon, Aisne, Hauts-de-France, France. Built in the twelfth and thirteenth centuries, it is one of the most important and stylistically unified examples of early Gothic architecture. The church served as the cathedral of the Diocese of Laon until 1802, and has been recognized as a monument historique since 1840. Speyer Cathedral, officially the Imperial Cathedral Basilica of the Assumption and St Stephen, in Latin: Domus sanctae Mariae Spirae in Speyer, Germany, is the seat of the Roman Catholic Bishop of Speyer and is suffragan to the Roman Catholic Archdiocese of Bamberg. The cathedral, which is dedicated to St. Mary, patron saint of Speyer and St. Stephen is generally known as the Kaiserdom zu Speyer. Pope Pius XI raised Speyer Cathedral to the rank of a minor basilica of the Roman Catholic Church in 1925. The Old Cathedral of Coimbra is a Romanesque Roman Catholic building in Portugal. Construction of the Sé Velha began some time after the Battle of Ourique (1139), when Prince Afonso Henriques declared himself King of Portugal and chose Coimbra as capital. The first Count of Coimbra, the Mozarab Sisnando Davides, is buried in the cathedral. The Catholic Cathedral of Limburg, also known as Georgsdom in German after its dedication to Saint George, is located above the old town of Limburg in Hesse, Germany. It is the cathedral of the Catholic Diocese of Limburg. Its high location on a rock above the river Lahn provides its visibility from far away. 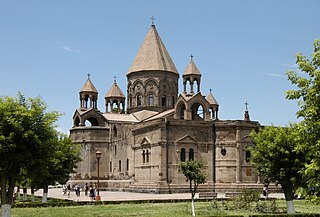 It is the result of an Early Gothic modernization of an originally Early Romanesque building and therefore shows a Romanesque-Gothic transitional style. The regional characteristics of European cathedrals are those characteristic architectural features which define the local cathedrals of any given region, and often transcend period and style. The Church of Notre-Dame de Louviers is a parish church located in Louviers, a town in the Eure department. It is a notable example of Gothic church architecture in northern France. The north façade, and, especially the south façade and porch, are some of the best examples of late Flamboyant Gothic architecture in France. The Romanesque style of architecture was introduced in Portugal between the end of the 11th and the beginning of the 12th century. In general, Portuguese cathedrals have a heavy, fortress-like appearance, with crenellations and few decorative elements apart from portals and windows. Portuguese Romanesque cathedrals were later extensively modified, among others the Old Cathedral of Coimbra, although it only had some minor changes.